Competition: Dezeen has teamed up with Tetra, an online shop dedicated to smoking accessories, to give readers the chance to win a patinated brass lighter case. Congratulations to the winner! Zarya Vrabcheva from the UK. The Patina Lighter Case was created by design studio Cofield. 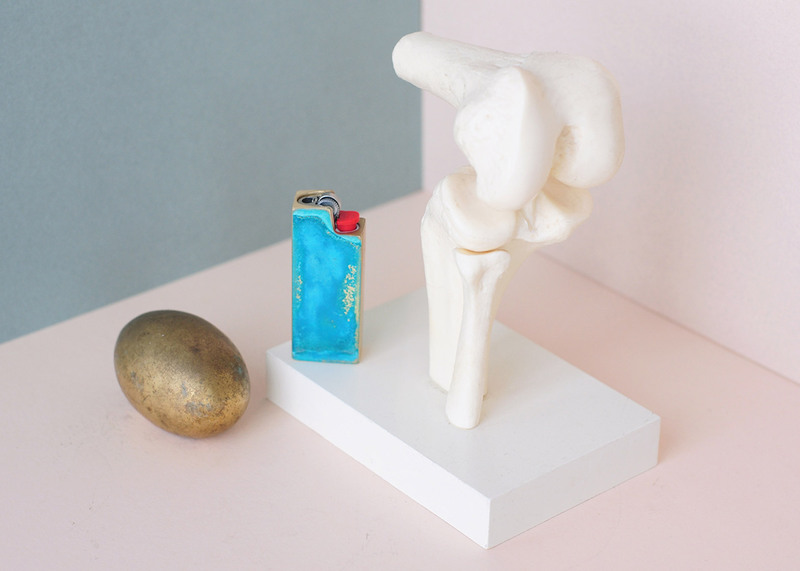 The cover is cast from solid brass to fit a Bic lighter as a way to update the smoking product. "Our aim with the Patina cover was to make the ubiquitous Bic lighter more precious," explained Cofield founders Sara Ebert and Jason Pfaeffle. "We wanted to elevate its presence so that it could become an accessory for the pocket or table." Patina is a coloured film that naturally develops on the surface of metal when exposed to atmospheric elements over a long period of time. This process can be accelerated and purposefully applied using chemicals. The larger faces of Cofield's metal lighter cover are hand-patinated, resulting in a watery arrangement of blues and greens on the surface. "We've always been fascinated by how bronze statues or architectural details become highly polished from human touch, in contrast to the rich browns and blacks of the rest of the piece," said Ebert and Pfaeffle. "We wanted to highlight and celebrate this duality of surface finishes and explore ways in which patina could be applied." As the patination process cannot be controlled, the surface of each case is unique. Rounded edges on the cover appear to be worn, also creating an aged effect. Tetra is an online shop dedicated to smoking accessory design. Other products for sale are lighters, ashtrays and incense burners. "We wanted to work with Tetra because it's great to be involved with people who celebrate design relating to all aspects of life, especially those that have often been neglected," the designers said. The site was founded by journalists Monica Khemsurov, Su Wu and Eviana Hartman. Khemsurov co-founded online magazine Sight Unseen, while Wu set up creative blog I'm Revolting. Hartman is a writer and stylist for publications including Vogue and T Magazine. The Patina lighter case is available to purchase from Tetra for $180.00 (£127.17). This competition has now closed. The winner will be selected at random and notified by email, and their name will be published at the top of this page. Dezeen competitions are international and entries are accepted from readers in any country.